Singapore: Indian shipping logistics provider Gateway Distriparks Ltd, which is part-owned by Temasek Holdings Pte, may seek acquisitions as new entrants struggle to achieve the scale needed in the world’s second fastest growing economy. “There’ll be a lot of consolidation fairly soon and some of them may merge," Gateway Distriparks chairman Gopinath Pillai said on Tuesday. There’s “very stiff competition from a lot of new players." Lalu Prasad, railway minister since 2004, opened up some functions of the Indian Railways for the first time to private companies for running container trains, building lines dedicated to freight, upgrading stations and setting up warehouses and logistics centres. The changes have led to about a dozen private companies entering the rail logistics and freight business, not all of which may survive, Pillai said. “The container business can handle three or four big players," he said. “The rest of it, in trains for instance, I can’t see more than two or three players." Gateway rose Rs3.30 or 2.23% to close at Rs151.25 on BSE. The stock has fallen 8.9% this year, compared with a 47% advance in the Sensex. Gateway, which has invested Rs200 crore in the rail business through its subsidiary, expects revenue from its joint venture depot with state-run Container Corp. of India Ltd (Concor) by the second quarter of next year. “Initially, it won’t be very significant", but towards the year-end it should account for a 10% increase in total revenue from the year earlier, he said. The Gateway Rail Freight Ltd unit signed an agreement with Concor in March to form a joint venture to operate the rail-linked inland container depot at Garhi Harsaru, Gurgaon, just outside New Delhi. “The reason for the joint venture is that Garhi is a very large piece of property. 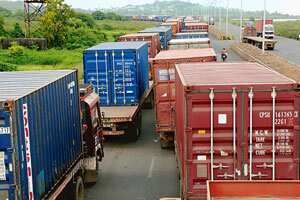 It’s the best location outside Delhi for a container hub," Pillai said. “With the help of Concor, we hope to make it a hub for double-stack containers. Concor now does double-stack to Jaipur, and if we can link it up, it would be a huge potential." The depot will help to more than double the total containers handled by Gateway Distriparks from the 300,000 it does now at all its locations. The Garhi depot can handle as many as 400,000 containers a year, Pillai said, citing Concor. Temasek owns 5.5% of Gateway Distriparks through its investment arm Aranada investments, according to Gateway. Gautam Chakravorthy in Mumbai contributed to this story.